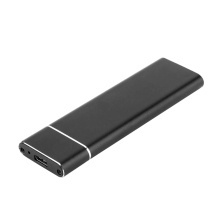 The M.2 NGFF to USB3.1 hard disk enclosure case is plug and play, portable and high-speed to use. M.2 NGFF to USB3.1 Hard Disk Enclosure Case M2 SSD Type-C Hard Disk Box. Supports 22*30mm, 22*42mm, 22*60mm, 22*80mm NGFF solid state hard disk (hard disk not included). Supports B Key NGFF SSD. Supports plug & play and hot-swapping. Easy to use, no driver needed. Compliant with SATA 3.0 specification and compliant with USB3.0 specification. Connects NGFF B Key SSD safely to computer via USB port.